A Fortnite player found Wreck-It Ralph during one of their games. The Pixar hero made a brief appearance during a match but so far has only been seen by one player. The cameo so far only features Ralph briefly showing up on one of the outdoor screens and doesn’t make any changes to gameplay. It’s also such a speedy appearance that it’s likely other players have experienced it but didn’t notice or weren’t able to capture the event. Streamer MozzzyyTwitch discovered this little easter egg and uploaded video evidence to Reddit where Wreck-It Ralph appears momentarily at the outdoor cinema Risky Reels. While so far only one player has seen this event, the timing coincides perfectly with the US premiere for the Wreck-It Ralph sequel, Ralph Breaks the Internet. 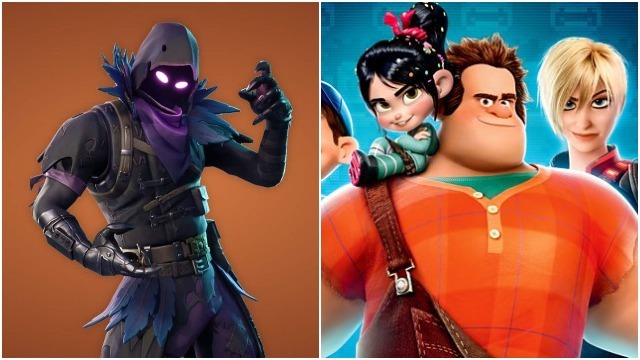 It’s surprising that it hasn’t been a wide-spread appearance and so far only one player found Wreck-It Ralph in Fortnite. The movie also reportedly has several callbacks to the video game. It’s not uncommon for Fortnite to do tie-ins with other pop-culture phenomena. Most notably, perhaps, was the appearance of Thanos in-game to promote Infinity War back in May. This instance where a player found Wreck-It Ralph in Fortnite doesn’t look like it’s going to go anywhere near as far as the Thanos event, which allowed players to find the Infinity Gauntlet and turn themselves into Thanos. This addition dramatically changed Fortnite at the time and we wrote about how it was one of the best things to happen to the popular battle royale shooter. Whether or not we’ll see more of Ralph in Fortnite as the movie hits cinemas around the world remains to be seen but fans are speculating that the Christmas season seven update will be arriving soon. Or if you’re wondering why we’d bother to report on a few seconds of an animated cameo in one of the world’s most popular video games, check out this piece which explains why Fortnite coverage has taken over every gaming website.